Many thanks to Netgalley, St. Martin’s Press and Paula Brackston for providing an ARC in exchange for an honest review. All opinions are 100% my own and independent of receiving an advanced copy. Xanthe and her mother move to the small town of Marlborough to start life over and open up an antique shop. Both are running away from bad men. They are low on funds and there is pressure to open up the shop as soon as possible. Xanthe has a unique ability. She has a special, magical connections to old objects that have a story to tell. She comes across a chatelaine that has the strongest pull she has ever felt. While trying to get the shop ready to open, Xanthe also discovers that there is a sinister ghost haunting the place, who needs her help. The ghost needs Xanthe to save her daughter, four hundred years in the past. The chatelaine allows Xanthe to transport her back in time. Xanthe travels back, but saving the girl is not going to be so easy. Yet again, I am sucked in by the premise of a book. I love books like “Outlander” and “Somewhere in Time” where the main character gets transported back in time. I love the setting of the book, a small town in England, with all the quaint shops and characters. Magical abilities, a ghost who needs the help of the living, are all things that I get excited about. Yes, I expected some sort of love story to happen, whether in current time or in the past. But all I have to say is Yuuuccchhhhhh!!! How can it all go wrong? First there are the endless descriptions. On and on and on about stuff that not only I don’t care about, but doesn’t serve the story and isn’t gorgeous English-side scenery. Then we have the worst ghost - she is mean, nasty, bitter, and I don’t know why. What was the whole story with her and her daughter. I wasn’t even convinced she loved her daughter because we never got to see that. She was just super angry. So if you aren’t going to make the ghost a sympathetic character then make her scary, I mean really scary. I never understood why Xanthe would have done anything for her. I just didn’t buy that she would leave her sick mother and go risk her life for this women’s daughter, it was a shaky premise at best. Then, don’t make me wait 60% of the way through before I get a glimpse of the love story and then expect me to be invested in it. There was so too much preamble and not enough substance. The structure was just off for me. Overall, I wasn’t invested in the main characters. I didn’t care much for Xanthe. I liked the townspeople, both present and past, but why was so much time spent on them and nothing interesting happened with them. All the characters were really one dimensional, no depth. It was so slow I just wasn’t invested in the character’s outcomes. There wasn’t much magic and the time travel wasn’t captivating enough to hold my interest. Honestly, I was bored, and really had to force myself to finish this one. I left it many times before finishing it. Disappointing and just glad to be done with it. 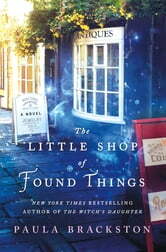 The Little Shop of Found Things is the latest book by Paula Brackston. I immediately fell in love with the characters and once "into" the story found it difficult to put down. Hated to see it end. Then discovered it's the first of a series and am excited for the next adventure. I was given an early copy to review. This was a wonderful story! I have to admit that I was probably first drawn to this book by its lovely cover. Isn't it gorgeous? 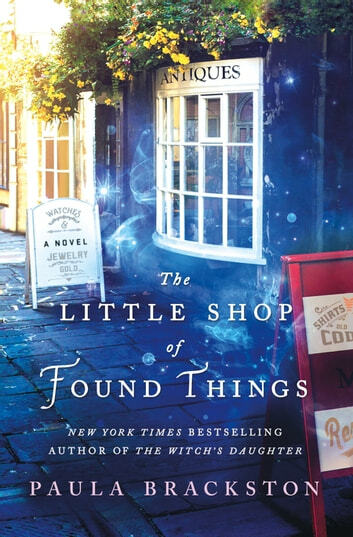 I also loved the idea of a book set in a little shop but once I knew that the story had an element of time-travel, I knew that I had to read this book. I was completely captivated by this book and couldn't wait to see how everything would work out. Xanthe and her mother, Flora, are starting over. They have bought an antique shop that they will be opening to the public as soon as possible. Xanthe is particularly suited for this kind of work because she has a very handy special ability. Xanthe is called to certain objects and intuitively knows the history of the items that speak to her. Xanthe sees a chatelaine at an auction and that purchase will end up taking her on quite the adventure. The chatelaine is tied to a young girl from the seventeenth century. The girl's mother is a ghost in Xanthe's present day and she insists that Xanthe go back in time to make things right for her Alice. I had a great time watching Xanthe trying to navigate the past and solve the mystery of what really happened with Alice. While in the past, she is able to help Samual with a project he is working on and he helps her work to save Alice. I believe that this was the first time that I have had the chance to listen to Marisa Calin's narration and I thought she did a fantastic job with this book. There is a lot of emotion in this story and I thought that she really brought it out through her narration. The voices that she used were very distinct and I thought that the dialogue in the story flowed nicely. This was a book that I found myself wanting to listen to for hours at a time. I would highly recommend this book to others. The ending was a little bittersweet but since it is the first book in a series, I have a feeling that there will be more developments in future novels. I had a fantastic time with this book and cannot wait to get my hands on future books in the series. I received a digital review copy of this book from St. Martin's Press via NetGalley and borrowed a copy of the audiobook from my local library via Overdrive. I really enjoyed reading this book. The style of writing is my favourite. I like a book that begins in th present & travels backwards in time, The Little Shop did it nicely, a few loose ends but because it's only book #1 I look forward to reading where they go.